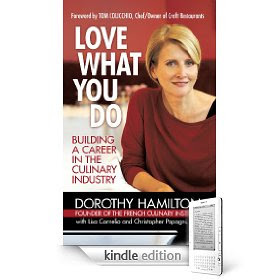 If you catch yourself daydreaming with an apron in the kitchen making roasted chicken and key lime pie instead of preparing another boring Power Point document for your boss, don't miss Dorothy Cann Hamilton's book presentation Love What You Do: Building a Career in the Culinary Industry. In Love What You Do: Building a Career in the Culinary Industry, Dorothy Cann Hamilton lends a helping hand to those forging their own professional path in the food world. Divided into three sections—“Deciding,” “Training,” and “Launching”—the book guides readers through each of the steps of any job hunt to find the career opportunity that is right for them. Cann also includes brief profiles of notable culinary figures, all offering their own words of encouragement and advice. Love What You Do gives you just the nudge you need to make a confident leap toward the food job you’ve always dreamed of.